Chuck Tyler was born in 1934 in Arizona. He was commissioned a 2d Lt in the U.S. Air Force through the Air Force ROTC program at Arizona State University on May 29, 1956, and went on active duty beginning October 16, 1956. Lt Tyler then completed pilot training and was awarded his pilot wings at Webb AFB, Texas, in March 1958, followed by F-100 Super Sabre Combat Crew Training from March to October 1958. His first assignment was as an F-100 pilot with the 7th Tactical Fighter Squadron of the 49th Tactical Fighter Wing at Etain AB, France, and then at Spangdahlem AB, West Germany, from October 1958 to November 1961, and then with the 524th Tactical Fighter Squadron at Cannon AFB, New Mexico, from November 1961 to August 1965. Capt Tyler next served as an F-4 Phantom II pilot with the 40th Tactical Fighter Squadron at Eglin AFB, Florida, from August 1965 to May 1967, and then deployed to Southeast Asia with the 555th Tactical Fighter Squadron at Ubon Royal Thai AFB, Thailand, from May 1967 until he was forced to eject over North Vietnam and was taken as a Prisoner of War on August 23, 1967. After spending 2,031 days in captivity, Maj Tyler was released during Operation Homecoming on March 14, 1973. He was briefly hospitalized to recover from his injuries at March AFB, California, and then served on the staff of the 58th Tactical Fighter Wing, later serving as a squadron commander, at Luke AFB, Arizona, from October 1973 to June 1977. 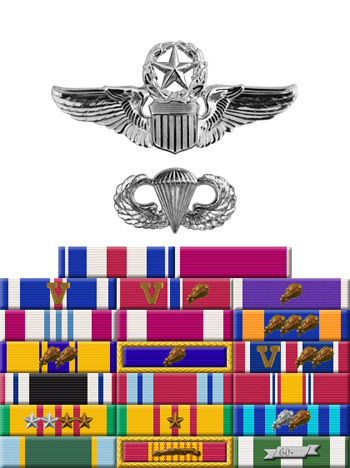 His next assignment was as Director of Combat Operations with the Deputy Chief of Staff for Operations and Intelligence with Headquarters U.S. Air Forces in Europe at Ramstein AB, West Germany, from June 1977 to June 1979, followed by service as Executive to the Deputy Chief of Staff for Plans and Policy with Headquarters Allied Air Forces Central Europe, also at Ramstein, from June 1979 to June 1980. 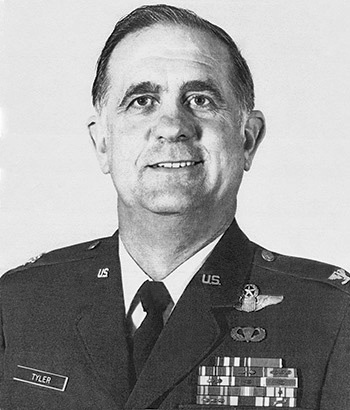 Col Tyler then served as an A-10 Thunderbolt II pilot, as Chief of Inspections, and as Special Assistant to the Deputy Commander for Resource Management with the 23rd Tactical Fighter Wing at England AFB, Louisiana, from June 1980 to June 1983. His final assignment was at Luke AFB, Arizona, where he retired from the Air Force on October 1, 1984. For the period August 1967: This officer distinguished himself by gallantry and intrepidity in action in connection with military operations against an opposing armed force during the above period while a Prisoner of War in North Vietnam. Ignoring international agreements on treatment of prisoners of war, the enemy resorted to mental and physical cruelties to obtain information, confessions, and propaganda materials. This individual resisted their demands by calling upon his deepest inner strengths in a manner which reflected his devotion to duty and great credit upon himself and the United States Air Force.